Criterion has decided to give out its Christmas gifts early this year, with the company announcing the release of Dodesukaden on March 17th next year. After a few less than desirable (and more than unavailable) Chinese releases, this marks the first time Dodesukaden (spelled Dodes’ka-den by Criterion) is available on DVD with English subtitles. Criterion’s release promises a new, restored high-definition digital transfer, as well as the now-standard episode of Toho’s Akira Kurosawa: It Is Wonderful to Create series, here concentrating on the creation of Dodesukaden. Also included are a trailer and a booklet that includes a new essay by Stephen Prince, plus an interview with Teruyo Nogami. What the release sadly seems to lack, however, is a commentary track. You can find the above information on Criterion’s website. Thanks to Christopher for bringing this new release to our attention! In related news, Criterion is also making Ikiru available as part of their second Essential Art House box set, released on 10th of February 2009. The first box set, released earlier this year, included a copy of Rashomon. Since it’s a onomatopoeia(I actually spell that without the aid of Google) is it wrong to use any hyphens or apostrophe(needed Google for that one)? How should it spelled? Assuming there is a right and wrong way. Well, the Japanese title is どですかでん, and that would be transliterated as dodesukaden if using the standard Hepburn romanization system. 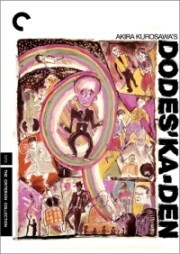 However, I can see why Criterion (and some others) rather use dodes’ka-den. The apostrophe is there because, as sometimes is the case with the Japanese su syllable, the vowel is silent. The dash, meanwhile, probably marks the fact that den receives its own stress. If anyone here reads IPA, the phonemic representation of what Rokkuchan repeats would probably be /do’des:ka,den/. I know some of IPA but I have yet to learn the meaning of ‘ and ,. Just for information, french publishers chose to write Dodes’kaden, and it seems that many countries opted for Dodeskaden. And about Criterion, they just published yesterday an article from Stephen Price entitled Dodes’ka-den: True Colors. I am not sure if the essay from which it is seemingly excerpted has been published recently (or planned to be) as part or whole of a book or especially written for this Criterion release. I was not sure about the best place to post this, so feel free to move it. 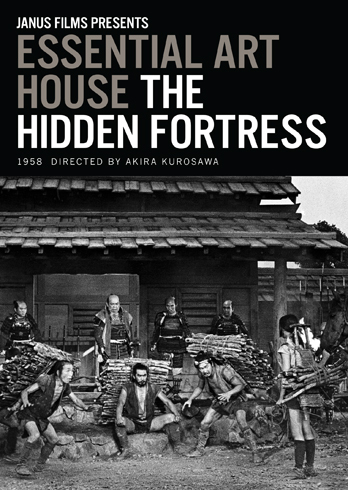 Criterion will release the 16th of June its third volume of Essential Art House (the cheaper and novice-moviegoer-targeted collection), and this one will feature The Hidden Fortress (along with Richard III about which we talked not so long ago, in Shakespeare’s top adaptations, and other great movies, of course). By the way, we get an interesting and unusual cover, showing all the main protagonists, as well as minor characters. Being unable at the moment to scan though, was that cover shot, ever in the movie? It’s awesome! But I can’t recall it at all. Hey Jeremy, isn’t that the shot where Mifune encounters the border guards and reveals one stick of gold in order to pass? it may very well be, but it’s been too long since i’ve seen the movie and unfortunately will not be able to see it any time soon. Sorry about the poor quality screenshot, but I think it’s enough for illustrative purposes here. Fabien: I know some of IPA but I have yet to learn the meaning of ‘ and ,. They are used to mark stress. A primary stress falls where I used the apostrophe and a secondary stress where I used the comma. These stress markers actually have their own UTF symbols as well, but apostrophes and commas do the job just fine. I had memories of this scene but not with these particular and expressive positions of the characters; I find this picture well chosen for a cover. Thanks for the precision, Vili, I’m interested in these matters but am more at ease with writing than with pronunciation. About the main topic, maybe didn’t you notice that Criterion published a conversation with Teruyo Nogami. And this time, it is explicitly mentioned that this conversation was done especially for the Criterion release, along with original sketches! Fabien, thanks for the information about the Teruyo Nogami interview! I had it on my list, but work has interfered with my ability to run the site on a timely manner. Apologies for that, and thanks again for linking to the page — the regulars will have found the information faster this way. Regarding the Czech ř, it apparently marks what we would technically call a raised alveolar trill (IPA symbol [r̝]). Now, a “regular” alveolar trill (IPA [r]) is the “r” sound you have in many European languages such as Italian, Russian, Greek, Dutch, and a great number of others (such as Corsican French, apparently). When it comes to English dialects, Scottish uses an alveolar trill, but regular British and American English do not — British English dialects tend to use an alveolar approximant instead, while dialects of American English use a retroflex approximant. But if you can pronounce [r] (the alveolar trill, i.e. the “Scottish R”), try “raising” your tongue higher (closer to the highest point in your mouth, which also means that the part of your tongue that touches the roof of your mouth pulls back a little bit). As you do so, you will probably notice that you are no longer able to fully “trill” the sound, i.e. your tongue won’t repeatedly tap the roof of your mouth as it does with the regular trill [r]. Instead, the air will escape almost continuously, giving a very “s-like” quality to the sound (that is why the Czech [r̝] is called a partial fricative). Wikipedia gives a recorded pronunciation of “Antonin Dvořak”, although to my ear it sounds like the female and the male examples actually differ quite a bit regarding their pronunciations of ř.
I have no idea if this has helped or just confused you more. 😆 As I am not really a phonologist, my insturctions may be neither fully scientific nor totally user-friendly. But at least I think that by following my own instructions I managed to pronounce the name of “Antonin Dvořak” like they do on the Wikipedia recording. Well, for now, it’s far easier to pronounce it isolated than in a full word, and it’s probably far from perfect. Some tongue training seems to be needed. It’s interesting how difficult it is for us to roll our tongues to produce sounds that we didn’t learn to pronounce as kids. They say that learning pronunciation is the most difficult part of language learning after the so-called critical period has ended. I, for example, grew up as a native Finnish speaker, and since Finnish has only one native sibilant sound (/s/, as in the English word “salt”), I still sometimes catch myself having difficulties pronouncing other sibilants such as those found in English (zoo, church, shoe, janitor, measure), even if English is today my everyday language. It’s not like I can’t pronounce the sounds, but I have noticed that if I’m for instance terribly tired, or translating between Finnish and English, it does happen. And in languages like Russian and Hungarian, which have pretty much the same set of sibilants, I struggle even more due to my being far less confident speaking them and therefore less sure which sibilant a word used. A part of this is probably because of the language teaching methods in Finland, which don’t (or at least in my time didn’t) really deal with pronunciation.